Occasional Brief Observations: Good grief! OK, step 1, take your ballot and make your selections... Easy enough you would think. 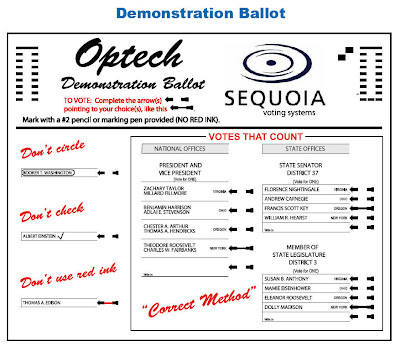 However, take a look at the ballot (below) - printed on the ballot are two parts of an arrow pointing at the candidate's names(s), and the voter has to connect the two halves to complete the arrow... (see the demo ballot and the instructions down below). Who came up with this ridiculous notion?? The correct methodology is to draw a line connecting the head and the tail of the arrow?!? This is nuts! So, before the elections Palm Beach, FL county voters should have gone to their local election web site, where they could see sample ballots and the associated instructions. Or, if they don't have "the tubes" surely these instructions are prominently posted at the polling places. 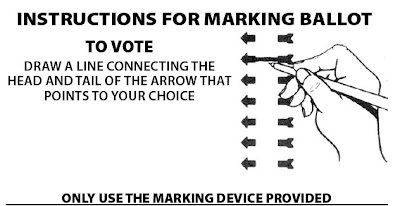 However, already, on television this blogger has seen reports that "people didn't understand the instructions" and wasted their votes by checking off or circling part of the arrow next to their preferred candidates! Ah, good grief! One could argue that if voters can't understand simple instructions then perhaps they shouldn't be voting... 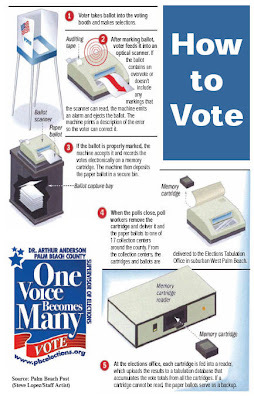 However, that aside, why would any sane person set up such a goofy method that is guaranteed to have people wailing about wasting their ballot, especially after the "butterfly ballot" debacle of 2000!